1) I wanted to say thank you for creating this and posting it for free on a non-gimmicky website. 2) I know plenty of people are where I was and are looking for something they can do for life ... so I guess I want to encourage them too! To start with I'm 22, female, 5'7". July of last year (9 months before my wedding) I was at 212 lbs and miserable with my weight. I had actually been around 145-150 for several years and had maintained it. But, when some major life stressors/events happened my sophomore year of college I developed BED. For those who don't know BED, binge eating disorder, is an eating disorder. It's more than just "bingeing every once in a while." BED is when you, on a regular (3+ times a week) binge on enormous amounts of food. While BED is a physical issue it's actually more of a mental issue. BED is literally an addiction, your brain goes through the same process as those addicted to cigarettes or alcohol ... unfortunately, though, my addiction was something I needed to survive. I couldn't just get rid of it. Through some wonderful Christian counseling I began to deal with BED and with the issues behind it. I began to realize that our bodies are temples of God. That I am important. That self-discipline was a gift. And that healthfulness was important because this is the only body you get on this earth. Even though I had pretty much stopped bingeing around May of 2009, I was steady holding my weight at 210+. When I hit my high weight (right after my fiancÃ©â€™s birthday) I knew I had to do something. A friend of mine challenged me to eat vegan for 30 days. I made it to 26 and lost 12 lbs ... but in the process my thinking about food began to change. I really began to see that food is not the enemy. Food is healthful and sustaining. I ate vegetarian for a little while and then switched back into my regular diet (I never ate red meat and always leaned towards meatless meals anyways). Then I found no-s. At first I thought, "This is too easy. If it was this easy everyone would be slim." I almost closed the webpage ... but something in my mind said, "No, don't. This makes sense." Deep down I knew that it was logical, regular patterns of eating. I just had NO idea how to eat "regularly"! I started by weighing myself weekly and kept that up for a couple of months. I have transitioned to weighing myself daily ... but I no longer obsess over it ... if it's up a little or down a little one day, I don't beat myself up. I was so shocked because after eating normal (ie not diet food) for a week I had lost 2 lbs! I kept it up and over the course of 8 months lost an average of about 1 1/2 lbs a week! I couldn't believe it! I had eaten like a sane person, actually enjoyed food, been able to go out to dinner with regular people and by the day of my wedding had lost nearly 60 lbs! I walked down the aisle at 153 lbs ... My dress was taken in 3 sizes and was still a little lose on my wedding day. I felt beautiful, healthy, and whole ... but most important I had learned to take care of myself. We have been married for 2 1/2 months now. Although I haven't been as strict as I was before the wedding I have managed to keep my weight between 150-157 lbs since we were married. I currently float around 155. I am getting ready to start being stricter again and really follow no-S to try and make it to the 135-140 lb range. I'm sorry I wrote so much but I am so excited and so thankful for what no-S has allowed me to do! Food is no longer an enemy and healthfulness is not impossible to achieve! Thank you again for this wonderful, healthful, and common-sense method that I will keep for a lifetime! Last edited by ashbeephoto on Thu Jul 08, 2010 8:55 pm, edited 1 time in total. Congratulations! Well done. I'm sure your friends and family (including your many siblings!) are very proud of you. Isn't painless self-control a wonderful thing? You kind of feel like you know a magic trick that other people just can't grasp. Congratulations to your husband and you on your marriage. I wish you every happiness together. And congratulations on eating normally, and on your weight loss! That is a tremendous achievement. Congratulations! It's an inspiration to hear success stories like yours. ashbeephoto wrote: I couldn't believe it! I had eaten like a sane person, actually enjoyed food, been able to go out to dinner with regular people and by the day of my wedding had lost nearly 60 lbs! Congratulations! Thank you for posting. I've think you've done a great job of summarizing the essence of NoS freedom and food sanity. I felt beautiful, healthy, and whole ... but most important I had learned to take care of myself. This sentence almost makes me cry. Congratulations!!!!! Not just for the weight loss but for the way you have been able to turn your entire life around. Your testimonial is absolutely beautiful. I'm sorry it took me a few days to see your post. This is wonderful news -- congratulations and thank you so much for sharing it. That sounds like a very sensible choice for someone in your situation (12, wow!). We had a question from another poster a while who was part of a similarly large, observant family a while back on how to handle S-days -- I wish your solution had occurred to me then. I am overjoyed to hear this. This is exactly the point of no-s.
And the chart is great too! And VERY best wishes and congrats on your recent marriage. How inspiring! Thanks for sharing with the rest of us. Congratulations and thank you so very much for encouraging us! I'm starting to try to pay attention to the testimonials page. I am on a Binge Free thread on Sparkpeople.com. I'm going to cut and paste the link to your update there. I still have my problems, but I love No S and think it can help so many people with eating issues, though possibly not alone. Thank you for posting your success--hope for the rest of us. What a wonderful story, thanks for sharing! And many congratulations on your success, both with the weight loss and with your newfound inner peace. Fantastic. Thanks everyone for the kind words ... I will try and keep my progress updated as best as possible ... for anyone who struggles with BED I'd be happy to connect with you Sometimes knowing you are not alone is the biggest step to recovery. Congratulations! Your height, natural weight, and highest weight is the same as mine! I found this to be super encouraging. Thank you so much for sharing. Did you exercise? If so, what did you do and what was your schedule? I am so impressed and encouraged by your testimonial! 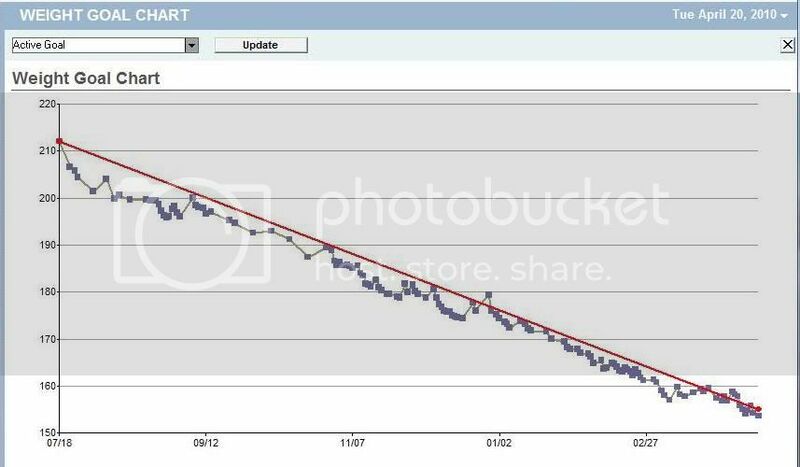 this chart is so amazing, look how you lost weight gradually and inesorably, no plateaus, no ups and downs, just a straight line, bam! not saying there is a wrong way to lose weight, but the way you did is just spectacular, in my view. Huge congratulations! Actually the way I understand the picture is that the blue dots are the actual weights and the red line is just the trend line. So you can see that there are ups and downs and little plateaus here and there. No body in this world handles the weight loss 100% cleanly and in a linear manner. Yes of course, but the deviation is negligible, especially considering this is a 60 lb drop, no peanuts. It doesn't usually look so neat.